The Blue Gem Scottish Fantasy Dirk takes an elegant and regal approach to traditional Scottish weaponry. This Highlander replica dagger is made of stainless steel throughout with a beautiful blue gemstone set within its flat pommel. 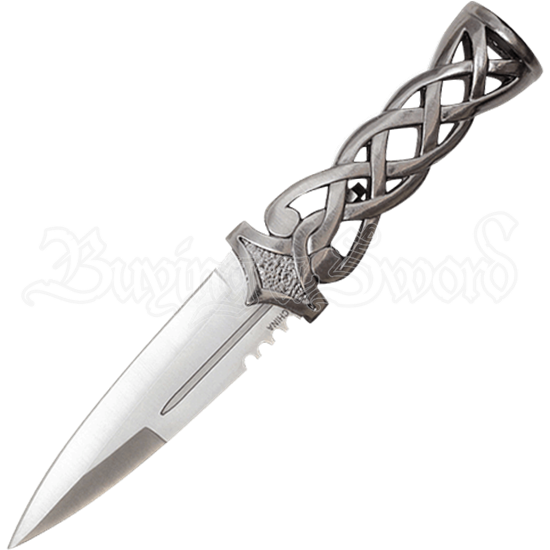 The eye-catching handle is made of solid stainless steel formed in Celtic knotwork twists that curl near the guard portion and base of the blade. Also made of stainless steel, the dagger blade has a spear point with minute serration and a narrow fuller detail near the hilt. The included matching black composite sheath features a matching steel knotwork tip, transforming this Scottish dagger into a beautiful collectible and display piece that blends historic Highlander weaponry with unique fantasy style.